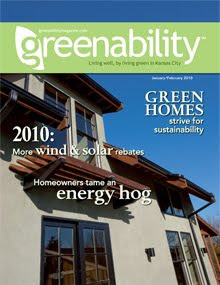 PlanetReuse featured in Greenability Jan/Feb '10 issue. PlanetReuse was featured in the article titled "7 Recycled and Reused Sources For Home Remodeling," of the Kansas City publication Greenability. The article features the seven top places in the area to turn to for donating old building materials or picking up some new gems for your home. The following is the section on PlanetReuse. "If you are looking for a specific piece or materials, check out PlanetReuse, a unique source for the green remodeling project. The company sells from a website with listings of reused and recycled materials from around the country. The beauty of the site lies in the matchmaking service it provides for free. If you do not see the material you are looking for in the listing, PlanetReuse can find it, at no charge. By simply placing a request, you will be guided through the process, have samples sent to your door, and even generate Leadership in Energy and Environmental Design (LEED) documentation for your project. Look at the materials listing, make a request for something specific and get your reusable materials sold by visiting PlanetReuse at www.planetreuse.com, or call 816-298-7947." If you would like to read the entire Greenability article titled, "7 Recycled and Reused Sources For Home Remodeling," check out the PlanetReuse Facebook group in the 'Group Photos' section!